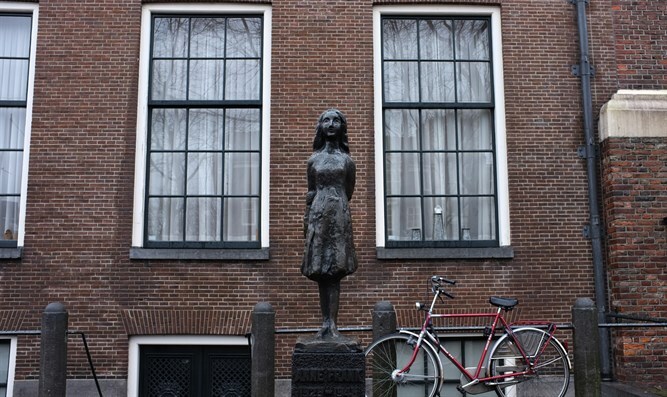 Commemorative plaque from tree mentioned in Anne Frank;s diary stolen amid acts of vandalism. A sapling from the tree mentioned in Anne Frank’s diary was cut down twice in southern Holland and its commemorative plaque was stolen. The sapling from Waalwijk, a town located 70 miles south of the Dutch capital, was planted from a cutting of a chestnut tree that in 2010 collapsed outside the Amsterdam building that served as the former hiding place of the Dutch teenage Holocaust diarist. Unidentified individuals broke the sapling in Waalwijk over the weekend. Park gardeners then bandaged it and announced they had saved it. But hours after the repair, the tree was again broken, the Brabants Dagblad daily reported Tuesday. “I call this an assault on acceptable behavior and tolerance,” Theo van Bracht, chairman of the foundation that is responsible for the park and which arranged the cutting’s planting there, told the newspaper. Frank, who spent two years in hiding until the Nazi Germans caught her and deported her to a death camp, wrote about the tree in the journal whose publication in 1947 has made her one of the world’s best-known Holocaust victims. After the tree collapsed during a storm, cuttings were taken from it and planted across the Netherlands and around the world. Arnoud van Doorn, a lawmaker of the Hague’s city council for the Islamist Party for Unity, wrote on May 14: “It’s busy in heaven,” talking about more than 60 Palestinians shot and killed that day by Israeli troops during Hamas-organized attempts to cross the border between Gaza and Israel. “May Allah exterminate the Zionists,” van Doorn wrote on Twitter in Dutch. Last year another lawmaker of the same party, Abdoe Khoulani, called Israeli children “Zionist terrorists in training” and “future child murderers and occupiers.” Dutch prosecutors dismissed complaints against Khoulani, saying that his remarks did not constitute incitement to hate.